Place Greek yogurt, cucumber, dill weed, 2 cloves garlic, white vinegar, 1 teaspoon lemon juice, 1 tablespoon olive oil, salt, and black pepper in a blender. Blend until smooth; set aside. Whisk together 4 cloves minced garlic, juice of 1 lemon, red wine vinegar, 2 tablespoons olive oil, and oregano in a large glass or ceramic bowl. Season to taste with salt and black pepper. Stir in chicken strips and toss to evenly coat. Cover the bowl with plastic wrap and marinate in the refrigerator for 1 hour. Remove chicken from the marinade and shake off excess. Discard the remaining marinade. Place chicken on a large baking sheet. Broil the chicken in the preheated oven until lightly browned and no longer pink in the center, 2 to 4 minutes per side. Transfer cooked chicken to a plate and allow to rest for 5 minutes. Heat 1 teaspoon olive oil in a large skillet over medium heat; place each pita bread into the skillet until warm and soft, about 2 minutes per pita. 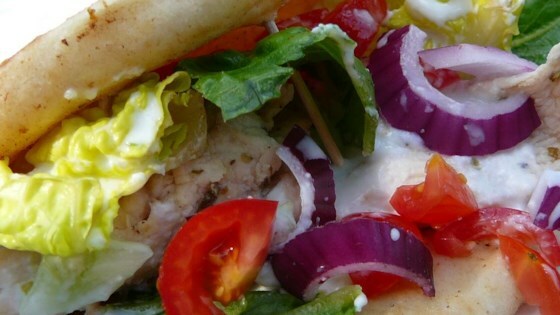 Serve warmed pita bread topped with chicken strips, yogurt sauce, tomatoes, onion, and lettuce. Simple step-by-steps for gyro lovers!